My son loves construction trucks among many other things. These are his new favorite pjs. They are still soft after many washes and have help up really well so far. Since I received them, they have been washed at least 20+ times and are still soft as I mentioned, and colors have not faded. They run a little small, so order a size up. My son is 6 and 40-45 pounds. He bounces up and down. Fast metabolism. I ordered a size 8 and thought they would be big and I would just save them for next year, but they are only a little and can wear them now. He is tall so that helped. I recommend!! 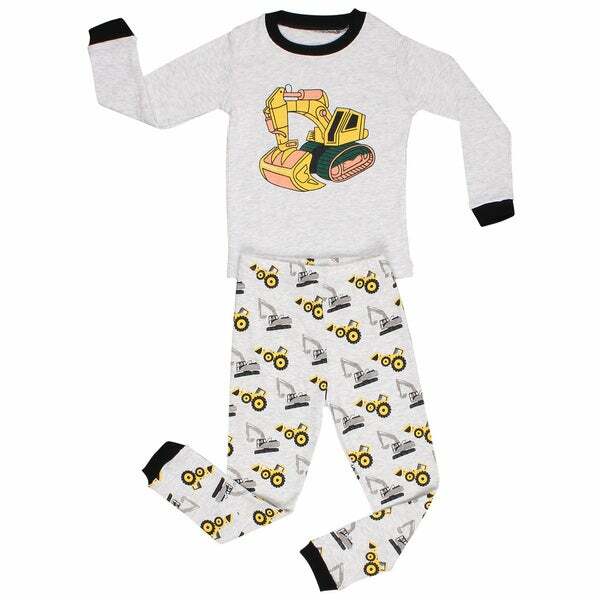 Display your child's fascination with big machines with this two-piece Elowel pajama set. With an adorable bulldozer pattern for a touch of rugged charm, this pajama set is machine-washable for easy maintenance. Love and great quality!! Just as pictured!! he is nice and warm !! wash $ wear great !!!! !